The photographs in this section represent native plants which are of particular interest to me as so many are threatened by the changes we have made to the environment and it seems that we have lost sight of their beauty in favour of exotic plants. Many of my photographs are taken as I hike on various trails in Ontario, others are taken in the Native Plant Garden that Pam has been developing in our back yard and a new addition are the plants that I have photographed in the Southwestern Biosphere of Nova Scotia. While I have photographed plants in other parts of Canada and other countries this Website focuses on the flora and fauna found in Canada. When I moved north of Toronto I was enthralled with the Trillium – had never seen so many and so many variations. The Oak Ridges Moraine is especially conducive to the growth of Trilliums who prefer sandy soil and hardwood forests. 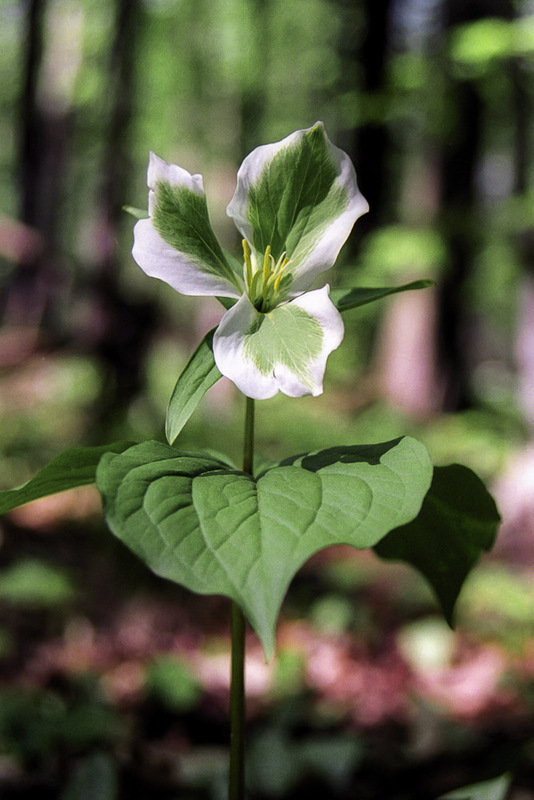 Happy Valley in King Township is an excellent place to see numerous varieties of Trilliums along with many other woodland plants and numerous bird species that call the forest habitat their home. The Nature Conservancy of Canada along with the Oak Ridges Land Trust and other organizations are making a concerted effort to protect this forest. The University of Toronto’s Koffler Scientific Reserve is another forested location containing a “near old growth forest” and spectacular hardwood stands. Many of the protected forests in Southern Ontario can be experienced by Hiking the Oak Ridges Trails. In the early Spring I enjoy the many parks on the north shore of Lake Erie as the plants begin to make their way to the surface a week or more earlier. Backus Woods with its mature Carolinian forest is a favourite spot for viewing woodland plants along with bird migration viewing at Long Point. I’ve also been concentrating on another interesting location for plant photographs, some of which are unique to the area. In 2001 UNESCO designation was given to Southwest Nova Biosphere Reserve which encompasses the natural regions in five counties in Nova Scotia: Queens, Shelburne, Yarmouth, Digby and Annapolis. Using the Nova Scotia Nature Trust’s Guide to the Atlantic Coastal Plain Flora of Nova Scotia, Pam and I have been able to find a number of the unique plants in the area as well as plants that are considered endangered or threatened such as Golden-crest and Redroot whose photographs can be viewed on this site.